At Nanobiz, we offer clients decades of experience to help grow their businesses by expanding existing markets and identifying and capturing profitable new markets and applications. We provide clients with a broad range of integrated services – from concept validation to market segmentation, from strategy to execution, from gap analysis to M&A support. India is emerging as one of the most sought after destination for the business growth. India is one of the fastest growing economies in the world and expected to become one of the largest economies by 2025. 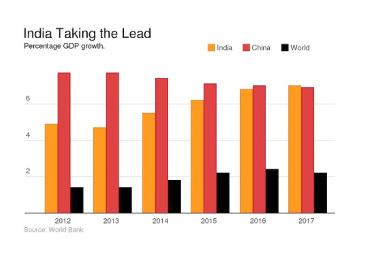 According to the World Bank, India could overtake China as the world's fastest growing economy in two years. The growth of Indian economy could accelerate in the coming years due to the ambitious plans of the new government to make the country's economy more efficient and vibrant. These trends are transforming conventional thinking about what it takes for any company to succeed on the global stage. For companies with global aspirations, India's market size and growth are key. Nanobiz, with its presence and experience bridging India and the U.S., provides end-to-end services for multinational companies wishing to capitalize on new trends in India's markets. As part of our emphasis on personal service, we organized practical brainstorming sessions and other client site work in the U.S., Europe, Japan and India with concrete, actionable outcomes. "YCC Inuagrual Meeting - Strategic Networking"
"The 5 Golden Rules of Business Requests"
"Transforming the World of Agrochemicals"
"Specialty Chemicals: A New Paradigm for Consumers, Materials & Life Science"
What Life Science Companies Need to Know. "Small & Large Company Collaborations"
Nanobiz specializes in assisting Japanese corporate and trading companies find and market science-based products and industrial processes in the U.S., Europe and India. This includes finding and vetting partners and acquisition candidates. Our Japan-experienced U.S. principals work with both our Tokyo-based principals and in alliance with Japanese consulting firms of IH technology Co., Ltd. and Ideation Japan Inc. Combining this expertise with our internal India-based multi-source search group and U.S.-based primary researchers provides cost-effective, deep information content. This provides the proper context to drive decisions in a step-wise and comparative manner.